Horace Julian Bond was a scholar, poet, former legislator, and activist in the American Civil Rights Movement. Julian Bond, as he came to be known, was born on January 14, 1940, in Nashville, Tennessee to Julia Washington Bond and Horace Mann Bond, an educator who served as the first African American president of Lincoln University in Pennsylvania, and as dean of the School of Education at Atlanta University in Georgia. Bond was married twice, first to Alice Copland (1961), and then to Pamela Horowitz (1990). He had five children. In 1957 Bond enrolled at Morehouse College where he earned a varsity letter on the swim team and founded The Pegasus literary magazine. In Atlanta, Bond embarked upon a lifelong career of social and political activism. He helped found the Committee on Appeal for Human Rights, an Atlanta University Center student group that engaged in three years of protests against Atlanta’s segregated movie theaters, lunch counters, and parks. In 1960 he joined several hundred students from across the South to form the Student Non-Violent Coordinating Committee (SNCC) at Shaw University. A grassroots organization, SNCC was one of the leading advocates of Black equality during the Civil Rights movement through protests and voter registration campaigns. Within one year of its founding, Bond became SNCC’s Communications Director, leading its publications and publicity departments. In 1961 Bond left Morehouse one semester short of graduation to join the staff of a new protest paper, The Atlanta Inquirer. He would return one decade later to complete a degree in English. Bond’s activism in Georgia politics grew out of SNCC’s organizing efforts in Atlanta. 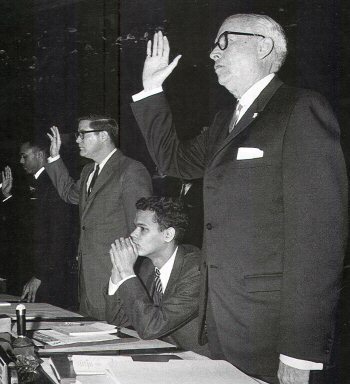 In 1965, Bond was first elected to a one-year term in the Georgia House of Representatives on a platform that included a two-dollar minimum wage, improved urban renewal programs, and an end of literacy tests for voters. However, the Georgia state representatives voted 184-12 not to seat him after he publicly endorsed the SNCC’s statement of opposition to U.S. involvement in the Vietnam War. In Bond v. Floyd (385 U.S. 116), the Supreme Court ruled that the Georgia House of Representatives was required to seat him. Ultimately, Bond served four terms in the Georgia House and six terms in the Senate. In 1968 he became the first African American nominated for Vice-President by a major political party at the Democratic National Convention, which he attended as co-chairman of the Georgia Loyal National Delegation. Despite his nomination, Bond withdrew as he was, by law, too young to serve. In addition to his legislative career, Bond also helped found the Southern Poverty Law Center, a public interest law firm located in Montgomery, Alabama. He served as SPLC’s president from 1971 to 1979, and later as board member and President Emeritus. He was the president of the Atlanta branch of the National Association for the Advancement of Colored People from 1978 to 1989. Similarly, Bond served four terms on the NAACP’s national board as well as Board Chairman since 1998. As an educator, Bond taught at many institutions, and held positions at American University and the University of Virginia. He authored numerous publications including Black Candidates—Southern Campaign Experiences and A Time to Speak, A Time to Act. His poems and essays have appeared in a variety of journals and newspapers. Bond also narrated a number of documentaries and hosted America’s Black Forum, the oldest Black owned television show in syndication. As an educator, writer, activist, and politician, Julian Bond had been at the forefront of social change in America. Horace Julian Bond died on August 15, 2015 at his home in Fort Walton Beach, Florida after a brief illness. He was 75. Clayborne Carson, In Struggle: SNCC and the Black Awakening of the 1960s (Cambridge: Harvard University Press, 1995); John Neary, Julian Bond: Black Rebel (New York: Morrow, 1971), Roger M. Williams, The Bonds: An American Family (New York: Atheneum, 1971).